I was never much for body care products before. I would use scrubs and lotions and shower gels because I had to in order to keep my skin smooth, my keratosis pilaris under control and my dry skin from literally driving me insane. But I actually encountered a body care line that treats skin issues other than the ones I have actually been fighting with. Over the years I have come to suffer these issues too, because at 46 I am no spring chicken anymore. I am suffering greatly after two car accidents. (I have 4 fused vertebrae and mobility issues, chronic pain and just general malaise.) And on my body I have cellulite and stretch marks from bearing two kids. Using a line like this was a fun opportunity for me to do something completely out of my comfort zone when it came to my body. The Green Coffee & Seaweed 2 n' 1 Soak and Scrub can be used in the tub or shower for exfoliation and increased circulation. It is a specialized combination of ingredients, along with Cell-U-logic’s advanced plant chemistry, that renews the body from outside in. With a combination of the ingredients in this formula, it relaxes tired muscles and provides a therapeutic sensory experience as it exfoliates and detoxifies, leaving you with smooth, vibrant and youthful skin. It is a light scrub with gentle exfoliating and detoxifying oils that has a fresh neutral scent. The formula is made with green coffee, seaweed, olive oil, peppermint, sweet almond oil and rosemary. What does this scrub actually do? It removes dead skin cells and helps to support cell turnover. It works with your skin to help eliminate toxins.Green Coffee Extract contains a key compound called CHLOROGENIC ACID, which is clinically shown to inhibit the release of glucose in the body while boosting the metabolism. Using this is such a great experience. I love getting rid of all the dead skin cells on my body and I love bringing up the circulation in my blood so that it starts really moving around and detoxifying my body, which is what it does. This is something I guarantee you will love. Slimming Gel helps visibly firm & contour targeted areas. It helps to restore skin’s elasticity, smooths and helps refine the appearance of dimpled areas, resulting in firmer looking skin. It also helps to encourage circulation and to supply nutrients essential for optimal skin health. Advanced Liposome technology delivers active ingredients deep into the dermis to replenish moisture, strengthen, and firm. The Slimming Gel's Key Ingredients are Green Coffee, Aloe, Guarana, Green Tea and Rosemary. The gel is a non-greasy, fast absorbing gel with a light menthol smell. The reason it works so well on us is because it has encapsulated caffeine for smoother, tighter looking skin, advanced liposome technology that delivers active ingredients deep into the dermis to replenish moisture, strengthen and firm. It visibly firms and contours the skin, it stimulates circulation and detoxifies, the encapsulated caffeine is there for smoother, tighter skin and Green Coffees' Chlorogenic acid slows fat absorption rate. It does not contain the following: Parabens, Phthalates, Petrochemicals, Artificial fragrances, Preservatives, Silicones, Propylene Glycol, Mineral Oils, Sulfates, Synthetic Dyes, Triclosan, EDTA and aluminum. See your skin visibly firm with the use of this advanced formula detoxifying Gel. 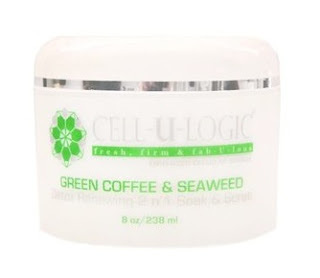 Encapsulated Caffeine smooths and tightens, while Green Coffee extract's Chlorogenic Acid boosts metabolism. Regular application improves skin's strength and elasticity, providing results you can see and feel - toned, contoured skin. CELL-U-LOGIC Anti-Aging Body Repair Cream dramatically renews skin's texture, boosts collagen production and reverses free-radical damage. It replenishes moisture and improves skin elasticity, refines, tones, and restores suppleness with a soothing aroma. This body cream has a non-greasy feel with a fresh citrus scent. It locks in moisture, enhances circulation and reduces inflammation to rejuvenate aging skin. The antioxidant-rich formula helps to both generate collagen and elastin, increasing firmness and strength for the appearance of youthful and vibrant skin. It contains the following active ingredients: Vitamin C, Lactic Acid, Omega Fatty Acids & Green Coffee. The lactic acid helps to remove dead skin cells and the green coffee helps to speed up blood circulation, while Vitamin C and the Omega Fatty Acids help to generate collagen and elastin. It firms and hydrates for younger-looking skin. It tones and revitalizes with the key ingredients of Vitamin C, Lactic Acid, Omega Fatty Acids, and Green Coffee. ADVANCED LIPOSOME TECHNOLOGY allows for deep penetration and optimal absorption of key nutrients. It dramatically renews skin's texture. This product does not contain the following ingredients, that have been shown to be harmful to the skin: Parabens, Phthalates, Petrochemicals, Artificial fragrances, Preservatives, Silicones, Propylene Glycol, Mineral Oils, Sulfates, Synthetic Dyes, Triclosan, EDTA and Aluminum. Regular treatment with this antioxidant-rich Body Cream helps reverse free radical damage and improve collagen and elastin production. Vitamin C,Lactic Acid, Omega Fatty Acids, and Green Coffee refine, tone, and hydrate down to the cellular level. Dramatically renews skin's texture- firms and adds vibrance while restoring suppleness with a rich, soothing aroma. I loved using this whole system. I found that after using it a whole month, my body looked smoother, felt softer and was firmer than it had been before. My keratosis pilaris was better from the scrub and my cellulite even looked a little smoother. I definitely think this had body care system had to do with that. I would recommend it. It is also has a very relaxing scent that when using the products just makes you feel so relaxed and made me want to listen to my favorite jazz. Here is a coupon for 20% off your purchase at CELL-LOGIC. Use the code in the photo below and you can get 20% off your total purchase. How awesome is that? CELL-U-LOGIC is sold online at www.cellulogic.com. Like CELL-U-LOGIC on Facebook:https://www.facebook.com/cellulogic; Follow CELL-U-LOGIC on Instagram:https://www.instagram.com/cellulogic/.